What Are The Best Online TESOL / ESL Graduate Certificate Programs? What Will I Learn in a TESOL / ESL Online Certificate Program? What Can I Do With a Certificate in English Language Learning? An online certificate in Teaching English to Speakers of Other Languages (TESOL) or teaching English as a Second Language (ESL) prepares students for in-demand careers. According to the National Center for Educational Statistics, the percentage of English language learners (ELL) in public schools increased by 3% from 2005 to 2015. The need for elementary and secondary teachers who can assess and address the needs of ESL students will increase in coming years, and the growing population of adult English learners will need postsecondary ESL instructors. George Mason University (GMU), based in Fairfax, VA, enrolls nearly 33,000 students through its online and on-campus degree programs. Pairing linguistic theory and research in instructional methods, the university offers a comprehensive graduate certificate in English language learning. The program features courses in English language mechanics, English phonetics and linguistics theory, as well as language acquisition and pedagogical methodology. All courses in this TESL program are internationally-accredited, and credits earned can be applied to a master’s degree in English from the same university. GMU’s 18-credit graduate certificate in teaching English as a second language can be completed in as little as one year as a full-time student. Courses are conducted through synchronous and asynchronous learning portals, which allows the program to feature individual instruction and group discussion. Out-of-state applicants are required to submit a $35 distance education fee, and all students must earn a minimum of 3.0 GPA in each course to earn credit. The graduate certificate in teaching English to speakers of other languages at Northeastern University provides students exposure to proven methods for communicating the use and structure of the English language. Located in scenic Boston, MA, the program is a comprehensive 18 credit curriculum based on leading research, practice, and theory in ESL instruction to adult learners. Students at Northeastern are also given the option of developing professional ePortfolios of their work. Northeastern conducts its TESOL program as a hybrid on-campus and online quarter-hour system. Only fall and spring quarters feature online instruction, however, as summer and winter courses require a residency. The one-year program includes courses in instructional methods, language assessment, and current issues in language education and literacy. Students experience a combination of small group work, lectures, classroom observation, and lesson design sessions. Instruction is focused on equipping students to work with learners of all types, from immigrant populations to university-level students. Indiana University-Bloomington trains emerging and established language instructors with a graduate certificate in English language learning program. The 12-credit graduate certificate in teaching English as a foreign language/English as a second language bridges the gap between academic and practice-oriented instructors-in-training, allowing students to select either a teaching program or a teacher-trainer program, depending on their goals. Students may also pursue a master’s degree in literacy, culture, and language education, with course credits earned through Indiana University’s certification program. Students complete a practicum assessment of literacy education, and coursework covers language foundations and instruction methods. Students may also select electives in global language contexts and computer-assisted language learning, which provides a highly-flexible concentration format. Potential students should note that a graduate certificate in EFL/ESL instruction is not equivalent to a state teaching license. The University of Colorado’s (CU) graduate certificate in teaching English to speakers of other languages is the only online certification program in the region, and prepares instructors for an increasingly global business environment. The hybrid program is taught through the university’s English department, giving the program the same high standards as CU’s full academic programs. Students have the option of completing the certificate as part of a master’s program or as a non-degree seeking student fully online, but applicants to the certificate program must already possess a bachelor’s degree. The 12 credit program can usually be completed in one year. Required courses feature a comprehensive survey of language theories, as well as courses on language acquisition methods, writing, and the sociology of language. An additional elective in cross-cultural communication strategies forms a valuable part of the teacher training program. Out-of-state online students of UC’s certificate in English learning enjoy a special discounted tuition. The University of Missouri-Columbia’s online TESOL graduate certificate is offered through the school’s College of Education. The fully-accredited program trains TESOL instructors in the best methods for teaching English to non-native speakers, with strategies for conducting courses in a variety of domestic and international contexts. Mizzou’s highly comprehensive language courses feature training programs for a range of professional applications, including language testing, educational curriculum writing, and language program administration. 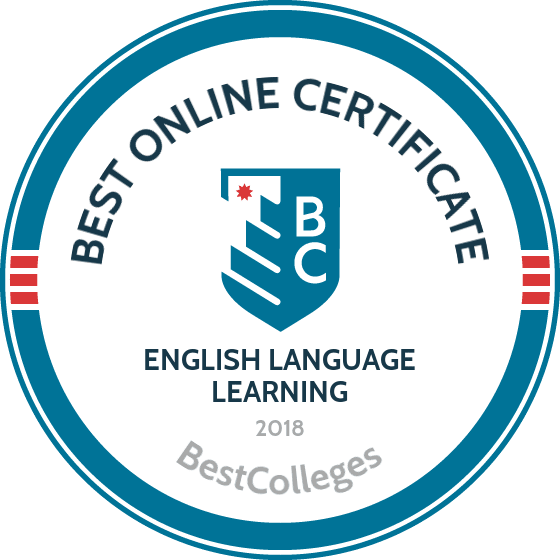 The 15 credit certificate in English learning is conducted entirely online in semesters, with the average student completing their graduate certificate in under two years. Potential topics include the instruction of English grammar, linguistics for educators, as well as an elective list of specialized courses for students to refine their certification. Successful applicants must hold a bachelor’s degree and a minimum undergraduate GPA of 3.0. The graduate certificate in TESOL from SUNY in Albany, NY, is a 15 credit program fully certified by the New York State’s requirements for English language instruction. The program is for current teachers wishing to develop their skills as language professionals. SUNY enrolls new students on a rolling March-August schedule, and all applicants must already possess a valid NY State classroom teaching certificate. Applicants to SUNY’s advanced TESOL graduate certificate program must have a completed GRE, GMAT, or edTPA. Students accepted into the program have at least 12 credits of study in a language other than English, and language courses taken through accredited institutions are considered valid as long as credit transfer is submitted. Courses cover many of the leading issues in language instruction, including audiovisual and computer-assisted learning methods. The University of North Dakota’s (UND) online graduate certificate in English language learning is a comprehensive 20 credit program that can be completed in under two years. The program coordinates with local professional organizations to create work-study opportunities and technology-assisted learning sessions. The semester-based program requires 60 hours of fieldwork, including supervised ELL teaching positions in your local K-12 community. Successful completion of the certificate requirements fulfills part of the eligibility requirements for a North Dakota ELL teacher endorsement. Courses cover complexity in linguistic and cultural contexts, but also provide the option to study challenges facing local rural populations. All students pay UND’s in-state tuition, regardless of their residency status. The language program at UND is recognized by the Council of Accreditation for Educator Preparation for meeting and exceeding the International TESOL’s standards. The University of Memphis offers an online teaching English as a second/foreign language (TESL/TEFL) graduate certificate. The program provides a foundation for training English instructors to succeed as a language professional within the US and around the world. The courses reflect a strict adherence to standards set by the International TESOL organization. Additionally, students have the option to complete a part of their program abroad through outposts in Spain and the Czech Republic. The 15 credit certificate program includes courses on the history and theory of ESL, skill assessment strategies, and English grammar. Students must additionally fulfill a field practicum component, and an elective drawn from a diverse range of courses and specializations. All applicants must hold either a master’s degree or a bachelor’s degree, and a minimum GPA of 2.75 to be admitted to the program. This TESL/TEFL certificate is not equivalent to a state teaching license. Based in Muncie, IN, Ball State University offers a graduate certificate in TESOL that prepares graduates to teach English both domestically and internationally, without having to fulfill the requirements of a traditional state teaching license. The 15 credit program can be completed completely online in about a year. Up to nine credits of the program can be applied toward a master’s degree of arts in TESOL, and several other graduate-level English programs as well. Courses in the TESOL program cater to the needs of many different types of learners, from emerging language professionals to licensed teachers looking to build on their existing knowledge. Courses in the program include language learning theories, methods for teaching English, and linguistics for educators. The University of Cincinnati’s (UC) TESOL online graduate certificate program addresses the diverse needs of all language learners, in the United States and around the globe. The Cincinnati, OH-based certificate program has the same requirements as other international TESOL programs, but students seeking a state teacher licensure take additional exams relevant to their state of residence. The 15 credit TESOL graduate certificate from UC can be completed in as little as one year. Courses in the university’s certificate program include language learning foundations, preK-12 methodologies and assessment strategies, and a field practicum in teaching English as a second language in supervised classroom environments. While students graduate with a certification or endorsement for an existing license, credits earned through this TESOL program can be applied to a master’s of education degree in curriculum and instruction. The comprehensive online graduate certificate in English as a second language from Arizona State University (ASU) features an 18 credit curriculum that caters to a variety of new and established language professionals. ASU’s language certificate program trains teachers on the latest skills in classroom reading and writing assessment, as well as the roles of administrators and policymakers within communities. ASU emphasizes the social and historical context of English instruction in the U.S., preparing graduates with a strong foundation in supporting ESL student language acquisition. The six course certificate can be completed in under two years, either as a stand-alone program or included with ASU’s online graduate master’s of education degree. Electives include topics of language structure, sociolinguistic issues in education, and parent involvement strategies for preK-12 students. Prospective students should note that the language certificate program is not equivalent to state-level teacher certification. The TESL graduate certificate from Kansas State University (KSU) in Manhattan, KS, prepares graduates for a variety of educational settings. The 18 credit online graduate certificate is offered in the university’s Department of Educational Leadership, and emphasizes instructional methods for the linguistic, academic, and cognitive development of adult learners. The university also offers a non-degree option for students who wish to enroll without fulfilling the requirements of a master’s program. All applicants must hold a bachelor’s degree from an accredited institution, and submit a statement of objectives and other necessary materials. Most students complete their certificates in less than two years, but the length may vary depending on whether a student is full- or part-time. Courses include the evaluation of adult learners, the principles of adult education, ESL methods, and international adult literacy. The University of Northern Colorado (UNC) in Greeley, CO, offers a brand new TESOL graduate certificate program. Full-time students can complete the 16 credit program in one year or less, while part-time students may complete the certificate in less than two years. Applicants must possess a bachelor’s degree from an accredited university, and present a minimum 3.0 GPA on their most recent 60 hours of course credit to be admitted. The five courses in UNC’s TESOL graduate certificate program cover teaching English to culturally and linguistically diverse learners, theories of language acquisition, best practices in ESL/EFL instruction, and linguistics for educators. Students must also complete a practicum through a supervised field work position. The online graduate certificate in applied linguistics and TESOL from Georgia Southern University (GSU) develops language teaching skills for both new and returning students. GSU’s unique applied linguistics focus broadens the application of language studies to incorporate more specialized areas, such as forensic linguistics and lexicography. The language education portion of the certificate is fully-certified by the International TESOL accreditation body, and incorporates domestic and foreign contexts into its instruction of methods for teaching English. Courses in GSU’s TESOL graduate certificate program include social and cognitive frameworks for language learning, with added instruction in how technology can be leveraged to create a more efficient and engaging curriculum. GSU’s 18 credit TESOL certificate program also allows students to specialize in the assessment and teaching of written English. All applicants must hold an undergraduate degree from an accredited institution with a minimum 2.75 GPA. GSU also recommends new students complete an introductory linguistics course before enrolling. The University of Southern Mississippi (USM) is home to one of Mississippi’s most popular online TESOL graduate certificate programs. USM’s TESOL program prepares graduates to teach English in a wide variety of settings. Distance learners use Blackboard to communicate with professors and fellow students, which allows for collaborative projects and convenient access to course materials. USM’s program feature two certificate paths. Plan A is for students without a master’s degree; students complete coursework on sociolinguistic and sociocultural perspectives, and the applied linguistics of language learning. Plan B is intended for students with a master’s of arts in teaching languages, and involves a smaller, 12 credit certificate centered on TESOL work. This allows students enrolled in USM’s graduate certificate program to structure their curriculum in a way that reflects their backgrounds and goals. The online graduate certificate in TESOL from Lesley University in Cambridge, MA provides students with a theoretical background and language learning strategies to succeed as a language professional. The program is designed in conjunction with international TESOL program requirements and the National Council for Accreditation of Teacher Education. This allows graduates to meet the endorsement standards of multiple states simultaneously. The certificate is intended for licensed teachers seeking to enhance their skills in English instruction to language learners from a wide variety of backgrounds. Course topics include sociocultural analyses of equity and inclusion, linguistics, oral language learning methods, and literacy skills. The 18 credit program is equipped with state-of-the-art technology and research-based applications of language methods, ensuring that students have the highest standards of instruction. Training in culturally-responsive teaching strategies forms a vital part of the certificate program. An interactive online learning community also ensures a high level of engagement with fellow students through chat programs and discussion forums. The graduate certificate in TESOL from Northwestern State University of Louisiana is an online-only program that prepares language professionals to teach English to students of all ages and cultural backgrounds. The program is for individuals who are not pursuing state teacher endorsements, and who plan to work in education organizations other than public schools, such as private schools, government agencies, and language instruction organizations. The 15 credit graduate certificate at NSU includes five courses that can be completed in as little as one year, if taken full-time. Credits earned in the program can be applied toward a master’s degree in English, with either a concentration in TESOL or a concentration in writing and linguistics. All online-only students are exempt from out-of-state fees. All applicants must have an undergraduate degree from an accredited institution in order to be admitted. Mercy College’s online advanced certificate in TESOL program offers language learning instruction with a range of applications in K-12 schools, private schools, and business environments. The program is more specialized than many TESOL programs, and is designed for those who have already fulfilled the requirements of a master’s of arts degree program in education, have at least 12 credits of university-level coursework in a language other than English, and already hold a teaching certificate. The four course English teaching certificate also includes a 20-day field practicum. Courses cover teaching English structure, English grammar, and mentoring tactics for a diverse population. Students must also complete a Content Specialty Test, as well as a workshop prescribed by the Dignity for All Students Act. The online graduate certificate in TESL/TEFL from Indiana State University (ISU) is recognized as a leader in English instruction. Graduates of the program are prepared to teach English in both domestic and international settings. The 12 credit online ESL certificate can be completed in two years, and courses are offered asynchronously and only during the summer. Applicants should note that a state teaching license is required to teach ESL in public schools -- a TESL/TEFL certificate is only one of several necessary qualifications for licensure. TESL/TEFL courses at ISU cover a range of topics, including theories of language acquisition and the syntax of English. Students also complete an elective course with a field work requirement. With six potential electives available, the certificate track at ISU is highly-customizable, which provides students the ability to specialize their certificate according to their interests. The program is currently closed to all international students, except US military and state department personnel. Northern Arizona University (NAU), based in Flagstaff, AZ, offers a TESL certificate that provides a foundational education for teaching in a variety of domestic and international settings. All students complete required courses with a minimum GPA of 3.0 in order to receive TESL certification. The certificate is the first step on a student’s path to full Arizona ESL endorsement. Additionally, up to 12 credits of the program may be applied to a master’s of arts in TESL from NAU, but interested students must apply separately for this option. The 18 credit certificate is eligible for federal financial aid and may be completed in conjunction with a separate graduate degree program at NAU. Courses under the TESL program cover a range of topics, including curriculum design, the development of instructional materials, and language skills assessment. The program addresses the needs of a diverse student population, and includes training in research-driven methods for efficient cross-cultural language acquisition. Although the curricula for graduate certificate in English language learning programs vary, they all provide knowledge, skills, and core concepts required to teach English as a second language. Listed below are courses common to most English teaching certificate programs. English Phonetics: This course presents a scientific survey of the sound system of the English language. Students explore how syllables are formed in English and prosody, or the rhythm of speech, with reference to different versions of English. This course prepares students for careers as speech-language pathologists. Introduction to Linguistics: This course covers fundamental linguistics concepts and terms, including phonology, morphology, and syntax. Students examine methodologies used in linguistic research and gain skills crucial for elementary and high school teachers instructing ESL students. Principles of Skills Assessment: Students learn to design assessments that are valid and reliable instruments for measuring English language aptitude. Since abilities vary significantly among adult students, this course is highly recommended for adult literacy instructors. Principles and Practices of Second Language Acquisition: Native language acquisition happens in a spontaneous and largely untutored manner, but learning a nonnative language often involves focused study and extrinsic motivations. This course covers the latest research regarding second language learning and is useful for postsecondary teachers working with adult English learners. Theory and History of ESL: This course surveys various methods for teaching English as a second language. It covers pedagogical theories and practices that have shaped the ESL field and provides a metalevel understanding of how ESL teaching has and could be conducted. This course is useful for instructional coordinators involved with developing new ESL curricula. The skills learned while earning a certificate in English learning may be applied to several professional roles. Students interest in educating children or teenagers become elementary or high school teachers. Those who prefer working with adult students become postsecondary or adult literacy instructors. Others find rewarding careers as speech-language pathologists, helping developmentally impaired children or older adults suffering from language disorders. Adult literacy and high school equivalency instructors help adult learners from diverse backgrounds improve their English reading and writing skills. Instructors adjust methods to address individual learning needs. Instructing younger students presents unique opportunities and challenges. Kindergarten and elementary school teachers provide younger students with skills necessary to succeed in higher levels of education. Instructional coordinators work with educational leaders and teachers to develop and implement curricula that address student learning needs and standards. They measure student outcomes and curriculum effectiveness. Postsecondary teachers instruct students who have completed high school. They lecture, research, and publish, and they may advise students in academic preparation and research. Speech-language pathologists identify and treat individual communication weaknesses. They may work with children struggling to speak clearly, adult stroke patients, or autistic learners. While most hold a master's degree, experienced ESL teachers with training in applied linguistics can excel as speech-language pathologists. Higher education institutions prove the quality of their educational programs by meeting accreditation standards. There are two main types of accreditation: regional and national. Traditionally, academically focused institutions are regionally accredited, and technical education institutions are nationally accredited. Regional accreditation remains the most highly regarded, but national accreditation is now often awarded to online colleges. The Department of Education publishes a list of recognized accrediting bodies. Although accreditation is not as essential for certificate programs as for degree programs, a school's accreditation status can affect financial aid opportunities, the ability to transfer credits, and employer perception. Schools of education are often accredited by the Council for the Accreditation of Educator Preparation (CAEP), and graduate certificate in English language learning programs offered by CAEP-accredited education departments are the most widely respected. A certificate program is a cost-effective way to gain valuable skills, but these programs rarely qualify for federal student loans. However, students should complete the Free Application for Federal Student Aid, or FAFSA, to determine their specific financial aid options. Private student loans are available to finance certificate programs, and many employers offer reimbursement programs for employees gaining the specialized skills presented in English teaching certificate programs.